TheWhat: Audio-Technica is now shipping two new microphones: a desk stand and a boundary mic. Both are compatible with System 10 PRO Rack-Mount Digital Wireless Systems and Stack-mount Digital Wireless Systems. TheWhatElse: Designed to work with phantom-powered, condenser gooseneck microphones with a 3-pin XLRM-type output, the ATW-T1007 System 10 Microphone Desk Stand Transmitter pairs with the System 10 PRO or System 10 digital wireless receiver of your choice to provide rock-solid, 2.4 GHz wireless performance. 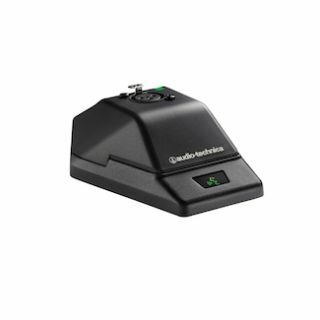 The transmitter is equipped with a 3-pin XLRF-type input, and features a touch-sensitive user switch that can toggle between talk and mute modes, or function as a press-to-talk or press-to-mute button. Two red/green LEDs—one visible from the front of the unit, the other from the rear—indicate toggle/talk/mute mode, battery level, and charging status. The ATW-T1007 offers three levels of input gain (-6 dB, 0 dB and +6 dB), which can be selected via a switch on the bottom of the unit. Another switch engages the low-cut filter. A good fit for conference rooms and other meeting spaces, the ATW-T1006 System 10 Boundary Microphone/Transmitter likewise pairs with any System 10 PRO or System 10 digital wireless receiver to provide clear sound quality with reliable 2.4 GHz wireless performance. This cardioid condenser boundary mic is also equipped with a touch-sensitive user switch that can toggle between talk and mute modes, or function as a press-to-talk or press-to-mute button. Two red/green LEDs – one visible from the front of the unit, the other from the rear – indicate toggle/talk/mute mode, battery level, and charging status. The mic also offers three levels of input gain (-6 dB, 0 dB and +6 dB) and the low-cut filter switch. For both units, a 3.7V rechargeable lithium-ion battery provides nine hours of use on a full charge and come with, of course, a USB charging cable. TheBottom Line: The ATW-T1007 and ATW-T1006 will be available spring 2016, and will be priced around $490 and $560, respectively.